You and your sas commando team are dropped in behind enemy lines.Raid the axis controlled manor, And kill the nazi major. This is another release from Gunrock that seems to be sleeping on his computer for some time and he, hopefully, decide to finally released it. this time there is only one date (also mentioned in the readme) that seems to be the good one. 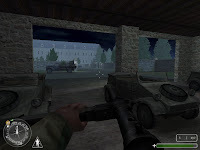 After playing a russian mission (Trench 86) this time you act in a british scquadron, objective is this time to travel by the country yard, eliminate the resistance arround the manor. 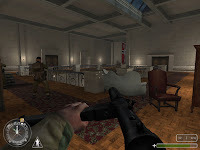 Afteryou get into the manor in order to kil the german officer, final objective is simply to escape. Design is well put together country yard is really realistic, the manor is impressive and the path arround it well connected, the whole outdoor is well put together and really nice looking. Inside part is also well build and use of texture and squale make this manor (lot's of room with high walls, changing layout, good lighting,...) an imteresting place to visit. Use of sound and music is simple but well fitting the release (we just could have hope briant use the original voice acting and add some new himself to make it even better). I thought the manor interior felt familiar/déjà vu . It is a copy of the "chateau" level from "Return to Castle Wolfenstein". Especially the grand staircase that splits into opposite directions. The fact that Gunrock has copied stuff and a lack of scripting/intense gameplay makes me think this is one of his earlier maps. It is average by his standards I guess.